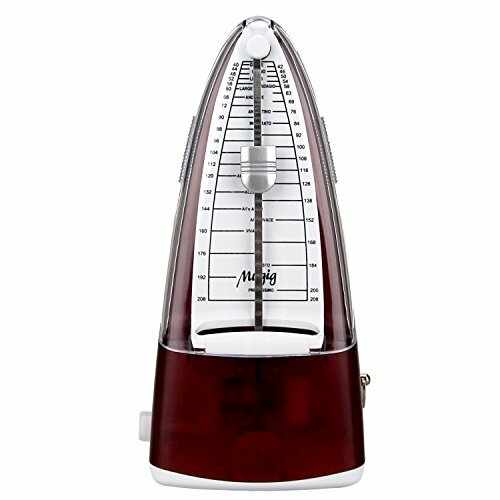 This metronome is designed for playing practice rhythmically, with click sounds at a setting rhythm and a swing pointer. It is a metronome with pyramid shape, low gravity center, stand steadily on horizontal surface, not leaning. Not battery required, no extra payment for battery, no need to change battery,this metronome will works as long as winded up. Adjustable working pattern, you can set a temple ranging from 40 to 208bmp and the metronome bell belling every 0,2,3,4,6 click. It can be universally used for piano, guitar, violin, drum, bass and other instruments. GGreat quality & no batteries required! !